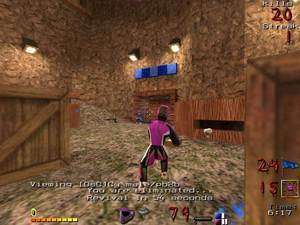 Paintball 2.0 is a action-packed shooter game for Windows (and other operating systems) which was originally based on Quake 2 as a modification for that game, but it has fully evolved to become its own gaming platform with many play modes like Capture the Flag, Attack and Defend Siege, Death match and Team Death match and many others offering hours of gaming enjoyment. Usage of this game does not require extraordinary hardware, so even if you have a much older PC, this game should run fine. For security reasons, you should also check out the Paintball download at LO4D.com which includes virus and malware tests. Additional screenshots of this application download may be available, too. Paintball download been highly rated by our users.